The weather here can be so extreme that it always brings the word "Armageddon" to my mind because sometimes it is so bad, that it can feel just like the end of the world. This kind of weather is largely unknown to us Europeans, apart from (thankfully) rare spectacular floodings. As most of you will know, that was the case last Thursday when severe storms hit the City and violent winds tore through parts of Brooklyn, uprooting numerous trees and damaging properties and people in its wake. I was at a work happy hour when it started. The skies turned black and the gusts of winds and pouring rain - even while in the safety of a bar - were very scary. 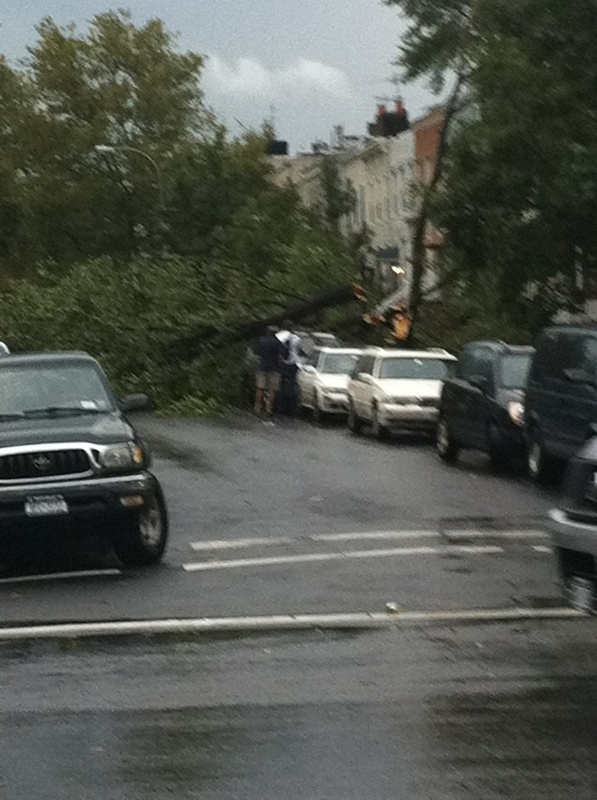 My friend LJ sent me the above picture of his street near Park Slope that he took on his iPhone. The storm finished almost as quickly as it started. The New York Times has some haunting pictures of its aftermath here.